Our most powerful resource in writing is God Himself. He who wrote sixty-six life-changing books, preserved as His holy Word, can enable us to share our messages of hope and truth through the mediums of fiction and nonfiction. With God’s help and guidance, we can share His masterful themes of restoration, victory, and hope. God knows what our specific audience needs to hear and how best to reach them. When you sit down to write, ask God to infuse His wisdom and creativity into your writing. When I’ve done that, the end result is so much better than what I could have engineered on my own. When we’re pressured to make a deadline, our writing can lose some of its wow factor. Prayer centers our minds and hearts on God and reminds us of what matters the most—our purpose for writing, our audience’s felt need, and God’s input into what we’re saying. Still your mind and heart before Him when a busy schedule is stealing some of your creativity, and seek His help to write a captivating message to your audience. Just as preachers and teachers are called to live what they speak, writers are called to live what they write. That’s how we know that what we’re saying works—we have lived what we’re writing about. One of the best tools for coming up with good material and relevant application to our readers, is to keep a spiritual journal. In the good times, we can record what God is doing and the opportunities He’s giving us to share the truth with others. In the storms of life, we can record how God is there for us and the lessons He’s teaching us. Both sets of circumstances not only become the framework of learning how life with God works, but they influence our writing because we write about those things we know. Have you ever been stumped with how to begin a blog post or chapter, and then out of the blue the first line comes to mind? I can’t count how many times that has happened to me, and my reaction is always gratitude. Maintain a spirit of prayer as you write, and let your mind be directed by the Holy Spirit. But remember that writing isn’t 100 percent God’s job. It’s a wonderful, exciting, joy-giving partnership with Him, one that requires a lot of work on our part and helpful guidance on His. We’re stronger when we work together. A threefold cord forms when God calls someone to write, and that someone calls on a friend to pray. 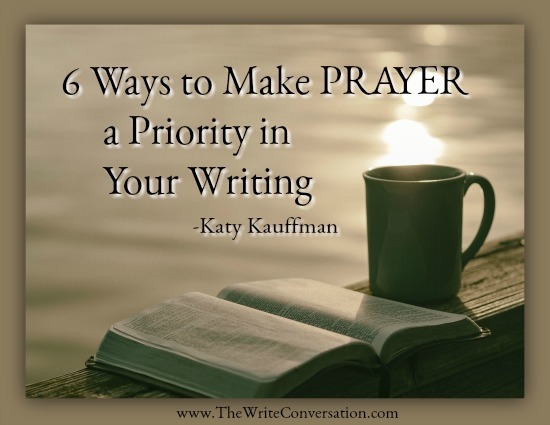 Allow your friends to reap a blessing by asking them to pray for your writing. God will bless them for their faithfulness to pray on your behalf, and they will also reap joy in seeing people’s lives changed by your words. In the course of writing two Bible studies, editing three compilations, and designing numerous magazine issues, I’ve found that something tends to go wrong. The computer dies. The printer runs out of ink right before the deadline. A storm threatens to knock out the power. The book needs a whole new element added. Some edits weren’t added as I had thought. Something happens. When we abide in an attitude of prayer, we can handle each obstacle, trusting God that He will help us to finish our project and that we will receive from Him the grace to do it. Instead of problems becoming a brick wall, they are only a hurdle to jump. And jump and jump. Writing conditions us to become relay runners, jumping hurdles and passing along the truth we’ve been given. Don’t stop short of your finish line. Do you write with an attitude of prayer? What are some things we can ask God for ourselves and each other as we write? Tell us in the comments below, and keep writing and keep praying! Katy, I love to pray and these are great tips. Thank you. Praying for you my friend. Thank you, Cherrilynn! I am glad you liked them. I know you love acrostics. Thank you, Ingmar! Happy New Year. Amazing how writing tips parallel life tips. Beautiful post! Yes, they do. Thank you, Julie! May God bless your writing this year. Powerful reminder, Katy! Thank you for a beautiful post! Thank you, Emme! I appreciate your comment. A life long writer's life line in the acrostic use of prayer. This is a keeper that motivates. Thank you for this encouraging message, Katy. Thank you so much, Carolyn! Prayer definitely is our life line. Thank you for sharing that. God bless you as you write! Thank you. I needed this message today. I am so glad it was just the right timing. God bless you as you write, Melissa! Thank you for this timely message. I also needed to be reminded of these points. Bless you as you practice your craft. Thank you so much! May God guide and bless your writing too. Beautiful post! Thank you for sharing. I needed this today. Blessings to you in all you do for Him! Thank you so much, Cindy! May God bless you as you write for Him. Praying His grace and insight for your writing.